Pickering, Whitby, Bradford, snow and a bitter cold wind – no not England’s largest county Yorkshire but Southern Ontario and just a few of the many location names in the area paying homage to the region’s English heritage. 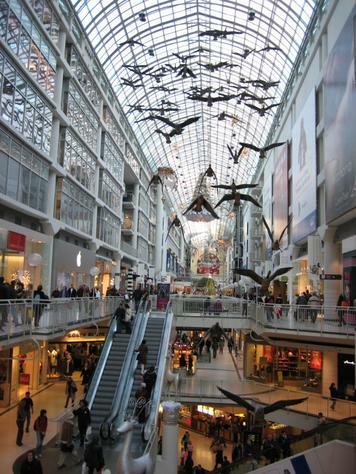 At the heart of Southern Ontario sits Toronto, provincial capital, and Canada’s largest city. Sitting on the edge of Lake Ontario the city is host to a wealth of culture, galleries, shops, world renowned restaurants and is classed as one of the world’s leading financial centres. Toronto has suffered from the recession like everywhere but 2011 sees an ambitious set of building projects due to restart or complete. The Ritz Carlton Apartments downtown, when completed will sell for between CAN$1m and CAN$9m a piece. The Shangri-La has just recommenced building a luxury 5-star on the edge of the entertainment district. Most noticeable are the amount of condos being erected by the lakeside, just south of the iconic CN Tower, a string of them are rising defiantly into the sky. With many near completion it is anticipated the strengthening Canadian economy will attract professionals to this part of town particularly those working in finance, telecoms, business services, arts, engineering and aerospace. Exploring the city in winter is a hard task, legs become heavy with temperatures reaching minus 27C degrees or more. However Toronto has developed an ingenious network of under city paths. Unlike the streets above which follow the classic North American grid system the paths below wind for around 27km and use colour coding to guide you. Peppering them are cafes, shops, restaurants and bars ensuring a vibrant underground atmosphere through the cold winter days. Stretching beneath the Financial District the network links the leading Toronto sites including Canada’s leading concert venue, the Roy Thomson Hall, the vast retail venue of the Toronto Eaton Centre with over 250 shops, the imposing Air Canada Centre which seats up to 19,800, and a variety of museums including the Ice Hockey Hall of Fame. Sitting rather incongruously in a former bank building constructed in 1885 the neo-classic facade belies the array of hockey artefacts within. The museum honours and recognises those who have supported and raised the profile of the sport both at national and international levels and for the novice presents the perfect initiation into this often brutal and violent game. You can even take on a life-sized simulated Ed Belfour in a hockey shoot out. Whilst the hockey museum provides valuable insight into modern day Canadian sport the Museum of Inuit Art, located in the Quayside centre, houses pieces made by the Inuit people of the Canadian Arctic. One of the country’s largest permanent displays of Inuit art the collection features 1,000 year old Thulpe artefacts alongside modern sculpture, jewellery and paintings of the traditional and modern variety. For children there are interactive workshops demonstrating the roots of the art which encourage attendees to experiment with the art themselves. Surrounding shops sell Inuit art sourced from Arctic co-operatives. No trip to Toronto would be complete without a visit to the CN Tower which measures 553.33m in height and has a glass floor situated at 342m. It takes a certain leap of faith, or in this writer’s case a very dry Martini, to pluck up the courage to stand on the transparent floor and view the tiny figures below, an experience which counters every internal instinct to believe that you won’t fall the hundreds of meters to the floor. On the dining front the recent move of eminent New York chef Scott Conant to The Thompson hotel has ruffled the local dining scene. 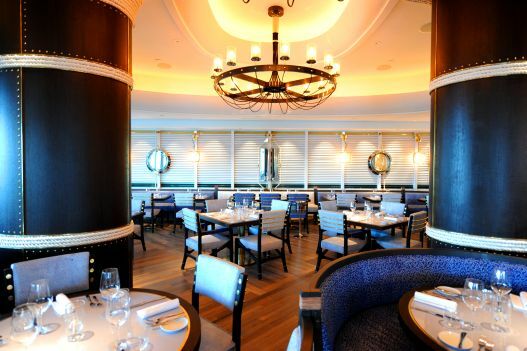 Booking a table at Scarpetta for its refined rustic food such as pheasant ravioli, or Sicilian spiced duck, is now an essential for any visitor to the city. However executive chefs are focusing on local produce to entice guests. Marc Breton at The Gladstone Hotel has created Harvest Wednesday where the menu is based on fresh produce delivered from a local farm that he’s invested in. David Garcelon at the Fairmont Royal York is producing honey on the hotel roof, from hives appropriately named the VI Bee Suite or the Honey Moon Suite, served on a delicate slice of cheese or drizzled over scones. The public face of Porter Airlines is a cartoon raccoon called ‘Mr Porter’, who features prominently in their marketing material appropriately attired and framed against the backdrop of famous landmarks to provide easily recognizable visual references associated with the 13 destinations (9 Canadian and 4 trans-border), the airline currently serves from its island base in downtown Toronto. Now raccoons, as those who have experienced them first hand will know, are actually pretty substantial and aggressive pests and very difficult to dislodge once they have set up home. Mr Porter therefore provides a clever metaphor for the role his eponymous airline plays in Air Canada’s host city market of Toronto. It is one that many Canadians – who are not known for heaping praise on their national airline – are smiling upon benignly as the continued growth in the airline’s schedule and traffic (to 1.26m passengers from its base at Billy Bishop Toronto City Airport in 2010), amply demonstrates. 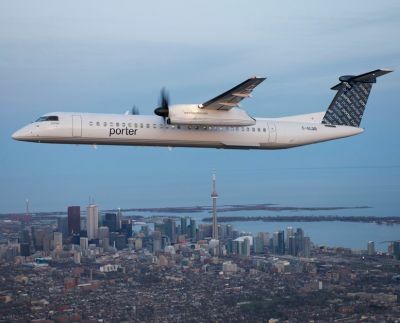 Porter has four new Bombardier Q400 aircraft due for delivery in the second quarter of this year and a further six on option. With load factors improving substantially (from 49.8 to 62.4 up 12.6% year on year in December 2010 and 7.6% in January), and ambitions to extend its route network, to cities in the North East and Great Lakes regions of the USA such as Washington, Philadelphia, Pittsburgh, Cincinnati and Cleveland, it is clear the carrier is going to provide a long term nuisance in Air Canada’s backyard. New high quality terminal facilities costing CAN$49m are now open. Air Canada finally seems to have woken up to the threat to their short haul commuter business traffic and is due to start services at Toronto City Airport later this year. On board the Porter service standard is maintained with comfortable leather seats in subdued cream and dark grey colours in a 2+2 configuration, offering the best leg-room of any cabin in its class because of the 70-seat configuration adopted by Porter, rather than the standard 74-seat fit out offered by Bombardier on the Q400. The aircraft also has a noise and vibration suppression system to reduce ambient noise levels making the flight relaxing and suitable for on-board working. The attentive crew, smartly dressed in uniforms harking back to the more glamorous days of airline travel, offer snack and beverage service on all flights, including complimentary soft drinks, wine and beer. 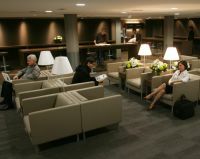 But with 159 of the 202 available slots, a limit imposed as a result of environmental restrictions on the airport’s operation, a high quality service offer encompassing a frequent and convenient Business Class service (all passengers have access to the domestic and trans-border business lounges in the terminal, comfortable leather seats in subdued cream and dark grey colours and extra legroom afforded by the reduced seat configuration adopted by Porter the airline is likely to remain the dominant player Billy Bishop Airport for the foreseeable future. As such, Porters Aviation Holdings Inc and its investment partners (Edgestone Capital Partners, Omers Strategic Investments, GE Asset Management Incorporated and DANCAP Private Equity Inc) deserve considerable plaudits for recognizing the niche market opportunity offered by the Toronto Port Authority owned, but largely ignored Billy Bishop facility and for developing a unique business model which exploits its considerable potential to the full. And so whilst there is much yet to be done by Porter in Toronto and in linking their other significant bases in Canada, their thoughts must also be turning to other potential opportunities to develop their airline/downtown city airport concept in similarly attractive markets elsewhere in North America. You can actually walk to the airport from many parts of the city centre, or it is not much more than five minutes by taxi. Lester Pearson is at least 45 minutes and can be expensive. Mind you the two minutes actual ferry time needs to be added although there is talk of a pedestrian subway. At CAN$45m it will be an expensive walkway.